We received this email the other day from one of our customers. 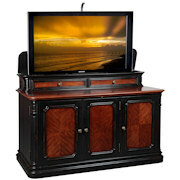 These customers purchased our lovely two toned Sycamore TV Lift Cabinet featured to the right. See what these customers had to say about their new TV lift cabinet. “It’s here and It’s FABULOUS!!!!!!!! We love hearing from happy customers. It makes our day. Thank you Montee and Sue for sending us this wonderful email.